It’s true my grandparents on my Mother’s side raised rabbits during the 1950’s, and at the time I was too naive to realize the reason why. I’m talking about the cute furry kind, and a decade later as a teenager I shot and ate my share of the wild version. Some would say that the grandparents on both sides of the family raised rabbits. The 1974 photo shown is my 7 siblings with our parents who at last count had over 50 grandchildren and great grandchildren. 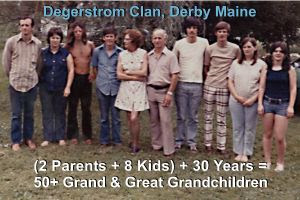 Here’s the names of the Degerstrom family from Derby, Maine, left to right: Ted Jr, Carol, Ed, Don, Blanche (Mom), Ted Sr (Dad), Jim, Eric, Janice, and Deb. Doubtless we represented one of the last big families from our town and that era. Our childhood names were less formal; for example Eric was “Ricky”. As much as 10 years after the last of us was born, Mom or someone figured out the first initials of the boys in birth order spelled the name of the oldest boy, Ted Jr, or T-E-D-J-R for Teddy, Eddie, Donnie, Jimmy, Ricky. I was named after an uncle (on a bet). With 3 boys and 1 girl when carrying me, Mom wanted a girl and was so certain I wouldn’t disappoint her, she already picked out my name: Barbara. Uncle Jim was surprised she didn’t have a boy’s name just in case, and she refused. The bet was “name it after me” if you’re wrong, and she’d get 10 bucks if I was a girl. It was boy-girl-boy-boy-boy-boy before she got her wish and the last 2 girls.